A few life lessons come to mind when I reflect on the life and legacy of coaching great Gene Bartow. By all accounts, he was a man of character with sincere concern and respect for the people he worked with and the players he coached. It wasn’t all about winning for him. There were more important things than that. He understood that how you get there is just as important as getting there. Bartow also showed us that sometimes the biggest step up the ladder means going down and backing up, not going forward and upward. After leading then-Memphis State to the NCAA national championship game in 1973, Bartow coached storied basketball program UCLA for two years, leading them to the Final Four. There was the prospect of greater things to come–more winning, more money, more recognition…and then he stepped down. He stepped down to UAB in Birmingham, a second division program he would have to build from the ground up. But he saw the potential for something special. Within four years, he had moved the program to division 1 and led the basketball team to the Elite Eight of the NCAA Tournament. Under his able hand, UAB made seven straight trips to the tournament. In a world where the next promotion means more money and greater recognition, it seems counter-intuitive to opt for less of both. Yet that’s often the right choice, if not the conventionally wise one. Taking the road less traveled can offer rewards ultimately more satisfying and lasting. 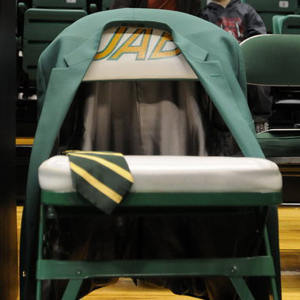 Just look at Gene Bartow. Let Philippians 2:3 be your guide: “Do nothing out of selfish ambition or vain conceit. Rather, in humility value others above yourselves” (NIV). Lead and serve others with humility. And remember Jesus’ admonition in Mark 10:43-44: “Whoever wants to become great among you must be your servant, and whoever wants to be first must be slave of all” (NIV).